Introduced in 2005, the Cort Pagelli PAG-1 has a beautiful single cutaway body shape. The body wood is mahogany topped with flame maple. The gloss finished mahogany set neck has a 22-fret rosewood fingerboard. The chrome plated hardware is top notch: TonePros licensed bridge, Cort CT1 tailpiece and three per side tuners. The pickups are two Mighty Mite humbuckers controlled by one volume and one tone control with a three-way selector switch. The finish options for the PAG-1 are light chocolate sunburst or transparent charcoal gray. The Pagelli models were designed by Swiss luthier Claudio Pagelli. The Pagelli ($795 retail/$450 street) is one of sleekest and most distinctive Cort models we’ve ever seen. This set-neck guitar plays fabulously, and it sounds lively and resonant. Its tones are warm and sustaining, and, thanks to its clear-yet-strong pickups, it can handle blues, rock, jazz, and virtually anything else you throw at it. And that’s even before you pull the Tone knob to activate the outside coils of both pickups. Armed with a tonal palette that can be as gnarly as the Alps, as crisp as the air of Adelboden, or as smooth and mellow as Gruyere fondue, the Pagelli is an all-around pleaser. Playability. Gloss finished neck plays very well. Feels light and nimble. Good action and setup. Plays very in tune. Tones. Pickups have plenty of output yet are clear and detailed. Warm rhythm tones, good lead bite and sustain. Delivers a good neck-pickup jazz sound. Really opens up in coil-split mode. Somewhat narrow Tone control range. Take the CORT PAGELLI (PAG-I) price survey. Looking to get one, love at 1st sight. Please which is better? 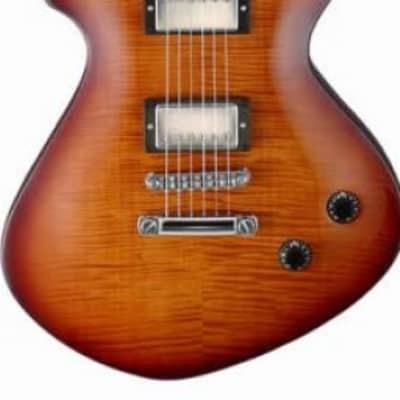 The PAGII is a grungier version of the PAGI, I reckon the PAGI is the better guitar.The PAGI has a classier finish with maple top visible though the sunburst or transparent finish, it has a separate bridge & tailpiece (the PAGII has a wraparound bridge). PAGI has Mighty Mite humbuckers versus Powersounds on the PAGII. The PAGII has a maple neck and the PAGI mahogany neck. But you might like the grungier look of the PAGII - you can get them with rusty finished hardware!